Chris Stroud’s grip is identifiable by a right hand “V” (at the base of thumb and forefinger) that points directly up his right arm at address, and by a left hand with a distinct angle at the wrist. In other words, it’s pretty strong – and barely distinguishable from the grips of his PGA TOUR peers. True, not every 21st century pro uses a strong grip. But the majority do, including such stalwarts as Bubba Watson, Billy Horschel and Brooks Koepka. 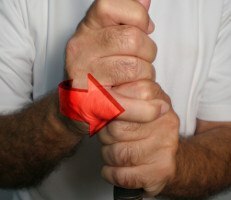 The main advantage of a strong grip is added distance, especially with the driver. Yet Stroud doesn’t seem to enjoy much of a boost, if any. 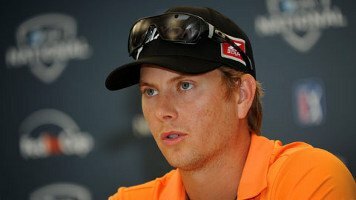 Despite his 6’2”, 180-pound frame, he typically ranks outside the tour’s top 100 in driving average. His accuracy stats are somewhat better, though far from great. So, how does the Texan manage to compete with the world’s best players? By cashing in his opportunities on the greens. Chris Stroud’s grip, putting version, has actually changed over the years. 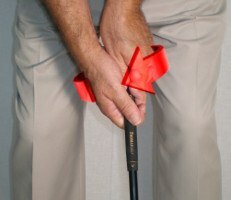 At one time, he went to a cross handed grip with a belly putter. However, 2014 found him using a standard reverse-overlap method with a regulation length putter, and it worked quite well. Stroud was seventh on tour in putts per green in regulation, propelling him to 10th in average birdies per round. 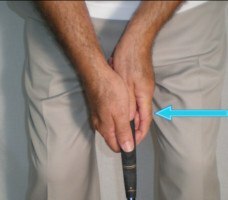 With his hands in neutral positions, Stroud lays his left hand index finger over his right little finger, a minor deviation from the norm. (Typically, the left forefinger covers two or three fingers on the right hand). This may prevent his hands from becoming rigid and short-circuiting his feel – try it if you struggle with your pace on longer putts.